A key part of the safe operation of a world-class refinery is the responsible managing of Waste & Slop Oil. Often these fluids contain a mixture of water, oils and other waste products from process stream spillage, overflow and controlled collections from on-site drainage systems. After consolidating in a drainage sump the fluids will likely separate, with inert solid wastes settling at the bottom of the sump along with the water and oil in the upper portion of the containment pit. In addition to these mediums, spent catalysts from Refining treatment processes may be present, which present their own environmental challenges. From a fluid-conveying standpoint the Waste & Slop Oil system must be capable of handling this non-homogeneous, stratified mixture, which due to aging can become highly viscous, as well as corrosive. As experience bears out Waste & Slop Oil systems, although small in capacity and working pressure, can bring their own unique challenges. The systems are intended to be used only intermittently, which means that there are long idle periods between uses when the waste fluids can set up within close clearance areas of pumps and valves. On a related note, proper material selection for system components should not be underestimated due to the diverse makeup of the process fluid. 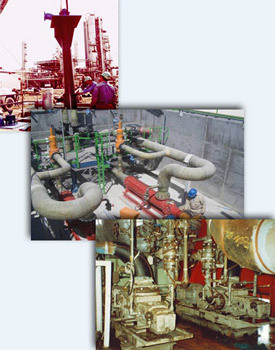 The pump itself will be subjected to nearly continuous internal and external exposure to the process fluid. Internally it is fully wetted to permit immediate start-up without priming. Externally the pump is submerged beneath a top deck plate, ensuring that any waste oil leakage is captured within the sump. Refinery production managers and operators around the globe have experienced the benefits that volumetric, rotary PD pumps can bring to these services. Having one machine that can efficiently transport a difficult, non-homogeneous mixture of spent process fluids makes life simple. A self-priming pump design means the equipment can be put into operation quickly at the push of a button. The high suction lift capability of rotary PD pumps rounds out their list of strengths, making them an ideal fluid-conveying solution for your Waste & Slop Oil systems.